Each year in Manchester, and cities across the country, people join together to raise awareness of mesothelioma, remember and honour the victims and promote an Action Mesothelioma Charter. The Charter includes a call for speedy and accurate diagnosis for sufferers, good quality treatment, funding of research into mesothelioma and for employers to provide safe working environments. 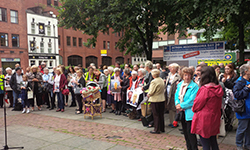 In Manchester, hundreds gathered to remember those who had lost their lives to mesothelioma. There was then a Dove release, where the granddaughters of victims of mesothelioma, released doves in remembrance of everyone who has passed away from mesothelioma. At the public meeting following the Dove release there was discussion of hope for the future in the fight against the injustice of mesothelioma. Trevor Barlow, who is currently suffering from Mesothelioma and has campaigned tirelessly whilst battling this disease, gave a very significant and passionate speech about the dangers of asbestos. He said he was aware he is “living with a death sentence”. He spoke strongly of the injustice of the history of inadequate research into this deadly disease, which claims as many lives as that of skin cancer and yet receives only a fraction of the funding. Trevor also spoke of his optimism for the future now that the Government have pledged 5 million pounds for the establishment of a National Mesothelioma Centre. It was highlighted that we must continue to keep campaigning so that ongoing funding is secured in the future. Dr Paul Barlow a leading oncologist, who specialises in mesothelioma and has led clinical trials to try to find more treatment options and runs the Cecilia centre in Wythenshawe which specialises in mesothelioma. Dr Barlow spoke of “being incredibly humbled by peoples enthusiasm for clinical trials to find better treatment for mesothelioma”. He also highlighted the importance of palliative care and collaborative research into this devastating disease. Helen Bradley, Partner and Specialist in asbestos related disease at Birchall Blackburn Law, attends this event every year. If you believe you have an asbestos related condition or would like further information about Action Mesothelioma Day please contact Birchall Blackburn on 0800 614 722 or Helen directly on 0161 238 5637.